In eye makeup fashion, falsies are False eyelashes that is glued onto ones eyelid and make the eyelashes apear darker and fuller. In fashion, falsies are paddings for use in a brassiere to create the appearance of larger breasts. The term has also, more rarely, been used for pads which create the appearance of larger buttocks. In both cases, there is a note of (more or less) amusement conveyed by the term. In a specifically humorous context, the term refers to moulded plastic replicas of female breasts that may be worn (covered or uncovered) by males for comedic effect. Typically held onto the chest by elastic straps or forming the top part of an apron, they are a perennial favourite amongst university students and at "buck's nights". The term is also a short way to say False Lashes/Faux Lashes. In the Victorian Era, girls were considered grown-up upon reaching the age of fifteen. However, many girls had not developed large enough breasts to fit into adult clothes, therefore bosom pads were used. When small, rounded breasts were in fashion, the problem was reversed. Adult women solved the problem with tight corsets and breast binding. When used after breast removal surgery, as for cancer, the usual term used is breast prosthesis. 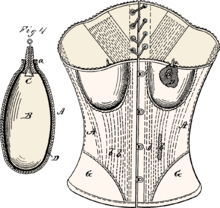 Wikimedia Commons has media related to Bosom pads.